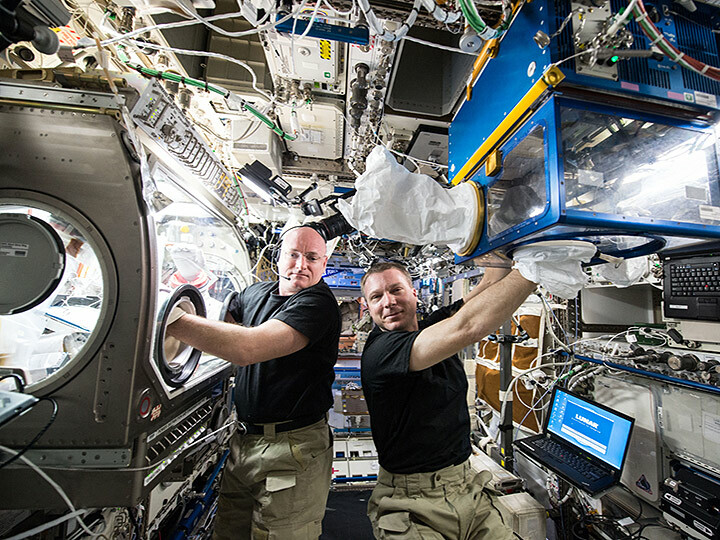 NASA astronauts Scott Kelly and Terry Virts conduct Rodent Research investigations within the Microgravity Science Glovebox and the Rodent Habitat Module onboard the International Space Station. The ISS National Lab announced its second Rodent Research Reference Mission, providing investigators access to biological specimens from mice exposed to spaceflight for a wide variety of research purposes aimed at benefitting human health on Earth. Rodent Research Reference Missions, which supplement traditional single-investigator rodent research missions, provide multiple investigators access to biospecimens from a single mission. The innovative Rodent Research Reference Mission concept is both beneficial for researchers and maximizes ISS National Lab resources. Building on the scientific success of previous missions using animal models, the Rodent Research Reference Missions adapt the standard rodent research format to maximize scientific research opportunities and resource utilization by providing multiple investigators access to biospecimens from a single mission. The International Space Station (ISS) National Lab recently announced its second Rodent Research Reference (RRR-2) Mission for investigators seeking access to biological specimens to support fundamental biomedical inquiries related to the effects of age on health after exposure to microgravity. The RRR-2 mission follows from the successful first Rodent Research Reference (RRR-1) Mission, which launched to the ISS on SpaceX’s 16th commercial resupply services mission in December of 2018. To learn more about the RRR-2 Mission request for proposals, or to submit a proposal, please visit the RRR-2 solicitation web page. Additionally, on March 22 at 10 a.m. EDT, the ISS National Lab will host a webinar to provide further background on the request for proposals and to answer any questions from researchers. To join this webinar, please register here. The persistent microgravity environment on the ISS National Lab has profound effects on living organisms that are reflected in significant changes to the physiology, behavior, and development of individual cells and whole organisms. These changes can mimic the onset and progression of disease here on Earth, providing researchers with valuable information on the mechanisms behind diseases such as cancer and possible new methods of treatment. The ISS National Lab serves as a truly unique platform to conduct research using translational models. 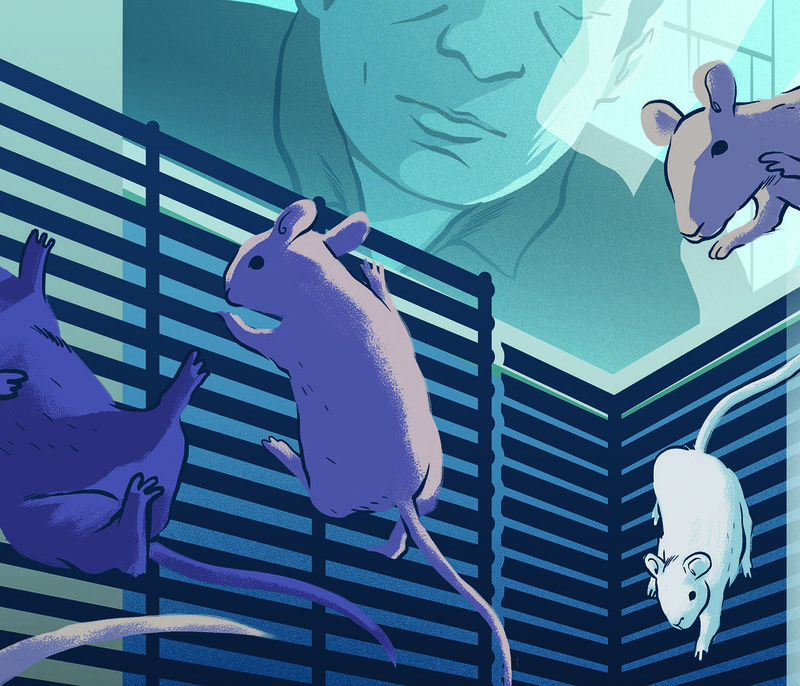 Mice and rats, who share the same genes and many of the same physiological characteristics as humans, have served as exceptional translational models in space-based research since 1983. The first rodent research mission with a dedicated research hardware system capable of housing rodents for up to six months was launched to the ISS National Lab in 2014, and since then, valuable scientific insight has been gained through the Rodent Research Program. The Rodent Research Reference Mission concept provides opportunities for investigators to obtain biospecimens from animal tissues that have been exposed to the spaceflight environment for a wide variety of research purposes. Insight gained from the Rodent Research Reference Missions may help advance research on diseases and aging effects involving muscle, bone, and other organ systems. The objective of each mission is to generate data that validates the rodent research model in space for the benefit of medical science on Earth. The significance of the Rodent Research Reference Missions rests in the adoption of an innovative and customizable mission concept that both benefits researchers and maximizes ISS National Lab resources. The Rodent Research Reference Mission concept significantly reduces the need for extensive feasibility assessment of individual rodent research investigations, enabling the ISS National Lab to rapidly implement Rodent Research Reference Missions, often reducing the time from mission concept to flight. Through the use of a simple and reproducible mission architecture based on use of the most widely used genetic strains of mice, it is possible for Rodent Research Reference Missions to be quickly integrated for flight to take advantage of open slots in the flight manifest due to shifts in the schedules of other projects. In this way, this new model has the potential to improve resource allocation by optimizing usage of available space onboard a flight vehicle. 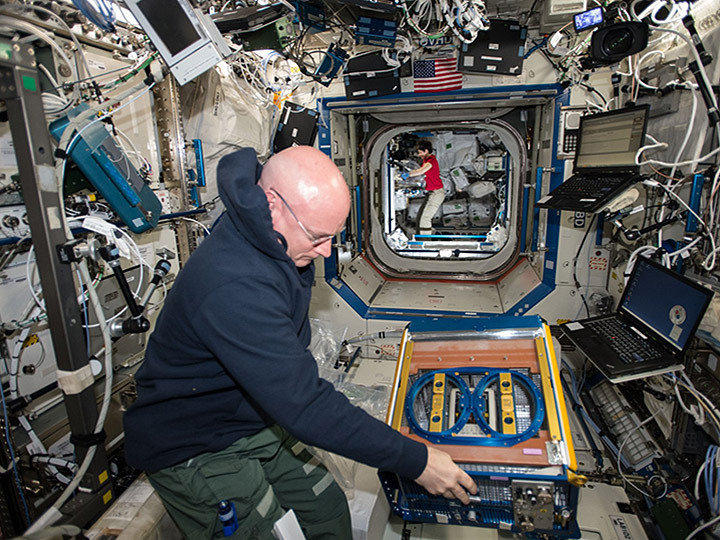 NASA astronaut Scott Kelly handling the Rodent Research Facility onboard the International Space Station. Each Rodent Research Reference Mission is a partnership between the ISS National Lab, NASA, and Taconic Biosciences, which provides the mice at no cost to the mission. Taconic provides selectively bred and genetically engineered mice and rats for research use to advance our understanding of human disease. Access to these invaluable research animals exposed to microgravity is provided to the research community at no cost by means of a competitive request for proposals in which investigators identify the specific biospecimens of interest to their research and how their research will advance knowledge to benefit life on Earth. With the experimental design and mission specifications clearly outlined in the solicitation for proposals, the predetermination of specimen allocation streamlines the proposal review process and enables distribution of biospecimens from each Rodent Research Reference Mission to multiple investigators via a tissue sharing program. Biospecimens that are not identified by investigators in response to the solicitation are maintained in a tissue repository and can be requested after the mission is completed. As part of their agreement for award of biospecimens, all investigators agree to share their data and publish their results after mission completion. 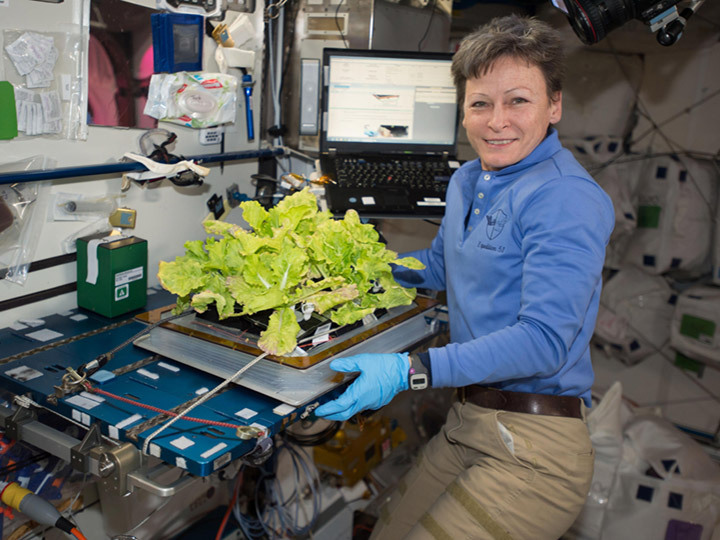 As the Rodent Research Reference Missions continue, the ISS National Lab aims to use these missions to continue to validate the use of different genetic strains of rodents for biomedical research for investigation of specific human diseases. The Rodent Research Reference Missions join the existing Rodent Research Program Missions led by single investigators as a supplemental yet crucial element of a pathway for new partnerships across disciplines and industries. 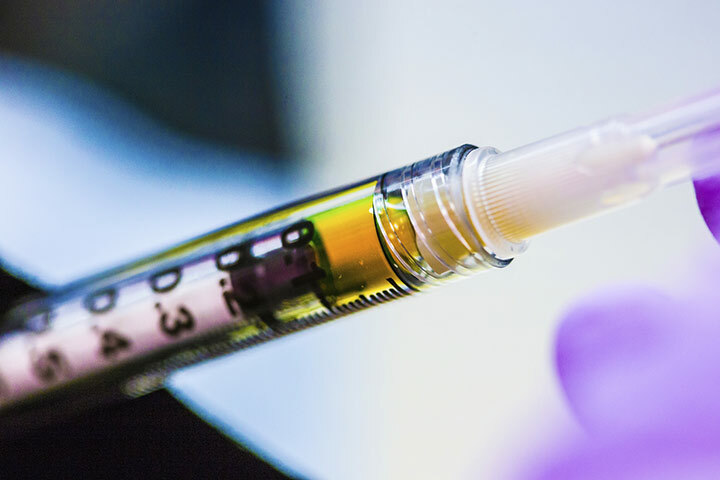 Partnerships with Sponsored Program partners, commercial service providers, and commercial suppliers introduced by this experimental design have the potential to expand access to invaluable biomedical research specimens, data, and knowledge. Additionally, cooperative partnerships such as these enable the costs of mission planning to be reduced while expanding access to specimens and data. The introduction of the Rodent Research Reference Missions, conducted alongside the existing Rodent Research Program missions, may advance scientific knowledge to benefit human health here on Earth and reflects the ISS National Lab’s commitment to delivering meaningful scientific advancement back to the U.S. taxpayer. Popular science content publisher Seeker feature article discusses the first ISS National Lab Rodent Research Reference Mission. NASA article discussing the first Rodent Research Reference Mission onboard the ISS. 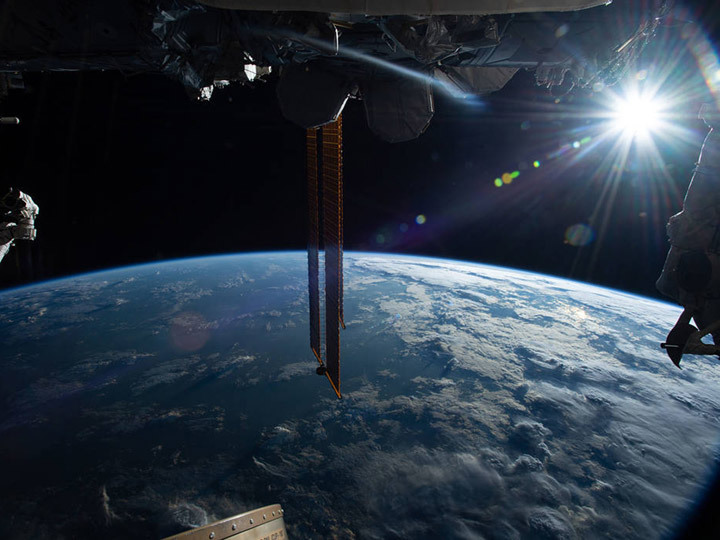 Upward feature article on the value of studying rodents onboard the ISS National Lab to better understand diseases affecting people back on Earth. Upward feature article on a rodent research investigation that successfully proved the robustness of a new potential osteoporosis therapy and led to significant improvements in the delivery of the therapy. ISS National Lab press release highlighting selected projects from the first Rodent Research Reference Mission. ISS National Lab press release announcing the second Rodent Research Reference Mission.